When I suggest doing a Facebook Live to someone who has never done one, most of the time they say they’re scared or confused. That is what has stopped them from doing one before. I think a big reason is because it’s a giant unknown thing. They don’t know what to expect. 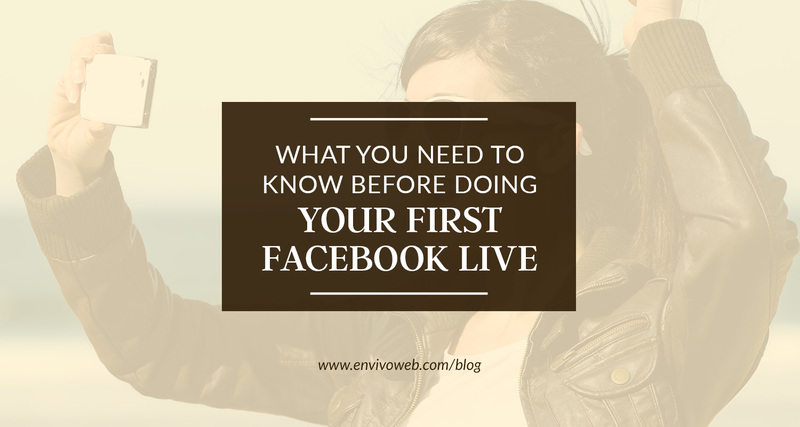 I wrote this post to explain what to do to prepare for a Facebook Live and what to expect. Once you are armed with this information, you will be more confident and you will do your first livestream! There are lots of best practices and tips and tricks I can share for you to do a powerful Facebook Live that will move your business forward. But for your first solo Facebook Live, your ultimate goal should be to just do it. Don’t worry about doing everything “right” so you’ll get certain results. The result you should go for is having completed a livestream. I’ll explain how Facebook Live works in three different areas: the tech, the content, and what to expect will happen during the live. Before I continue, I want to say that I’m going to cover solo Facebook Lives. It is possible to do a joint Facebook Live with someone else but that’s a topic for another time. You can go live on the Facebook mobile app or on the computer. I’ll teach you how to do it on the Facebook app since most people do it using the app. If you want to do it in portrait mode, continue as normal. If you want to do it in landscape mode, you have to unlock your phone’s screen and rotate your phone. When you rotate your phone, the buttons and everything should rotate, too. If they don’t rotate, you need to unlock the rotation of your screen. How you do this is different on each phone. Google “[name of your phone] unlock screen rotation” to find tutorials on how to unlock your screen rotation. Do a test run. Before you start, set the privacy setting so only you can see it. Check the screenshot below. You want to look for something like that. It may say that or look like a little person or globe icon. Select “Only me” or “Private.” You may need to expand the list you are seeing. Then start livestreaming on your phone and check on your computer if it’s working. ***IMPORTANT*** Make sure next time you create any type of post (written, photo, live video, pre-recorded video, anything), you change your privacy setting back to whatever you had it at before. Record somewhere where there is little to no noise. Make sure you are well-lit. Sit in front of a window. Don’t sit with the window or any major light source behind you. Brush your hair, check your teeth for food, put makeup on if you want to. You don’t need to look perfect but you do need to look presentable. Make sure your camera is clean. Wipe it with a microfiber cloth or a Q-Tip. Prop your phone up on something so you don’t have to hold it. I find that people are more confident if they have at least a general idea of what they’re going to talk about. Some people feel even more confident with an outline. This may seem obvious but I’m going to say it anyway: I recommend you choose a topic at the very least. Pick something that you feel very confident speaking about. Determine what you want your viewers to walk away having learned. Write three main points you want to make. If you need to have notes and to refer to your notes, then do it. My very first livestream was on Periscope and I had my iPad with me. I referred to it whenever I moved into a new point. I didn’t try to hide it. People were still engaged and I didn’t get anyone criticism for it. And if anyone did judge me, who cares? I did it, I survived it, and people enjoyed it. There are many schools of thought about how long your Facebook Live should be. But since this is your first Facebook Live and the purpose of it is to take action and do it, just go live for 5 minutes. Distractions will happen. Play along with them. Don’t ignore them. Once a fly kept buzzing around my head. I tried ignoring it. Eventually, I instinctually swatted at it in the middle of a sentence. I laughed and explained to the audience what happened. They were amused. Interestingly enough, I spoke with someone months later and she recalled that moment. I didn’t even know she watched the video. She said that she loved it because it was so real and authentic. Comments will appear at the bottom of the screen. After a certain amount of comments, you won’t be able to see them all anymore but they are still there. You can also type a response back to them if you need to. You can just acknowledge the comment out loud since, you know, you’re on video. You may or may not get people watching you live. If you do get people, great! Say “hi.” Continue with your presentation. If nobody is on live, great! Continue on with your presentation. Many people will see your video after you’re done. And even if nobody ever sees your video (which is very unlikely), you achieved your ultimate goal: livestream for the very first time. I share all these points with you because I know the more prepared you are and the more you know what to expect, the more confident you’ll feel. And the more you do it, the more confident you’ll get. The beauty of livestreaming is that people know it’s raw so they don’t expect it to be perfect. Just get into action! And when you do, tag Envivo in the comments so I can come and cheer you on!